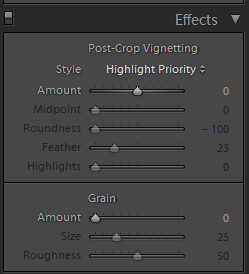 I have already covered how you can easily add vignettes in adobe lightroom using the effects panel and how to add off-centered vignettes in Adobe Lightroom 5 but how to add these off-centered vignettes in earlier versions of Adobe Lightroom ? 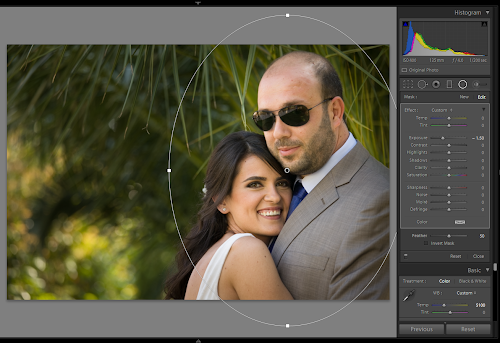 Although the process is a bit trickier than it is in Lightroom 5 it is still rather easy to do, instead of using radial filters this time we are going to us the brush tool. You can now use the brush to paint all over the image that negative exposure we have setup in the brush and just leaving out the part you want to put in perspective. It is not uncommon to paint more than you would like to, in that case you can simply delete portions of what you painted by clicking the ALT key. As you can see, clicking the ALT key will show a minus sign on the paint an that can be used to remove the effect of the brush. Finally you could also make use on the “Show Selected Mask Overlay” option (Green rectangle), that will show a red mask overlay on the portion of the picture affected by your brush. This is a handy way to make sure you didn’t miss any part and/or painted right where you wanted to. 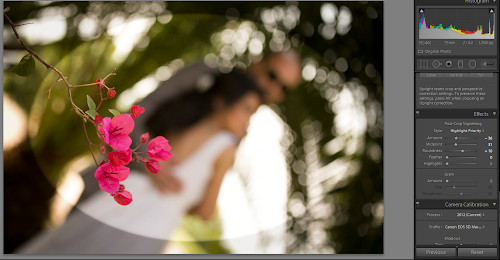 In the last article we discussed how to add vignettes in Adobe lightroom using the “post-crop vignetting” feature. A bit problem with that feature is that it doesn’t allow off-centered vignettes! As you know it is not uncommon in photography to have the main subject moved from the dead center of the frame. 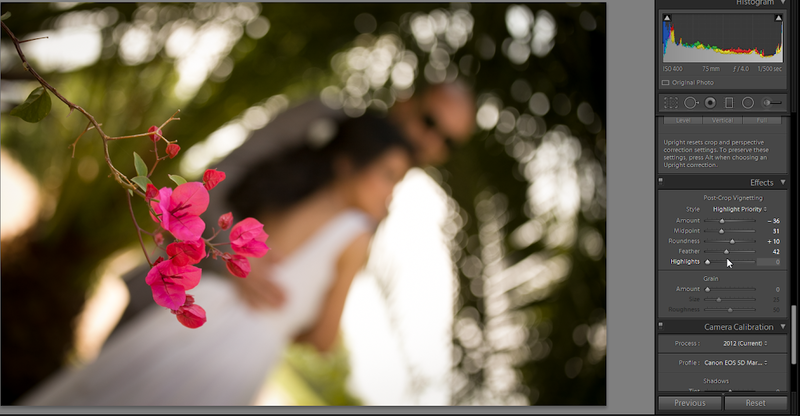 So if we use the “post-crop vignetting” feature on these images we will be dimming the main subject instead than the putting it in perspective. 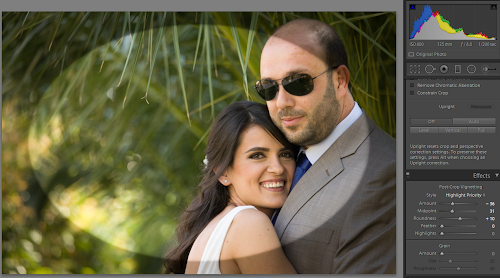 Plugging in the same settings as the ones used in our previous tutorial on the off-centered picture below will clearly show that the head of the groom is getting dimmed and a big portion of the background isn’t. For that reason we are going to see another way to do vignettes using a new feature in Adobe Lightroom 5and that is “Radidal Filters”. 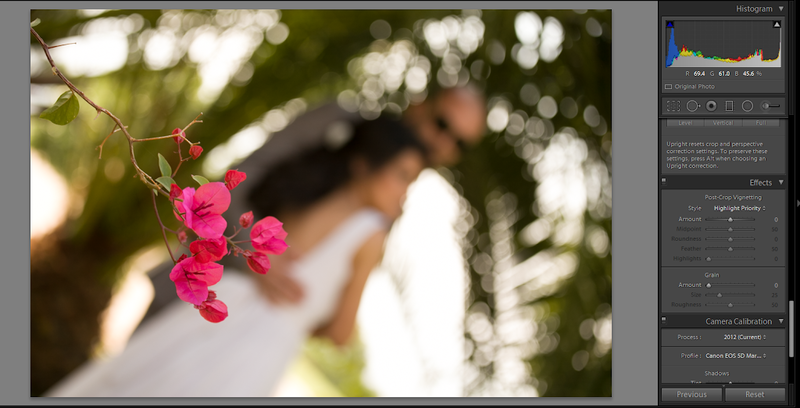 As a start open the picture you want to edit and go to the Develop Module by clicking D.
Today we are going to see how to easily add vignettes to your pictures in adobe lightroom using the “post-crop vignetting” tool in Adobe Lightroom. The amount slider: will affect the “hardness of the vignette, by hardness I mean how transparent/subtle or opaque the vignette will be. Pull it to the right hand side and the vignette will be white, and to the left hand side it will be black. The feather slider: will affect the edges of the slider from hard edges to soft edges depending of the effect you are looking for. 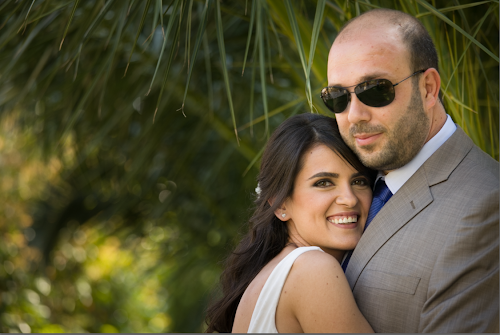 Now let’s try to put that into practice, assuming we have this picture I took at a friends wedding and I want to add some vignettes to it to make it stand-out more. As a start i prefer to keep the feather to 0, which will give me hard edges, since that will help me better see the effect of the vignette on my picture. Since I want a black vignette I will use a negative amount and play around with the Midpoint and Roundness sliders to my liking. Now I will progressively push the feather slider to the right hand side till I obtain the result I want. here is what the final picture looks like. If you are planning to buy Adobe Lightroom 5 please consider using our amazon affiliate link for that. 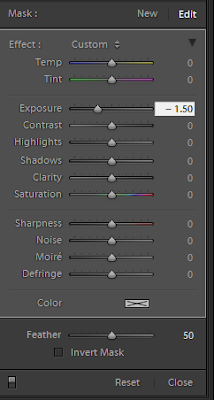 Now that I have moved my post-processing workflow to Adobe Lightroom 5 and PhotoLine and dropped Adobe Photoshop the first thing I wanted was to be able to switch back and forth from Adobe Lightroom 5 to PhotoLine as simply as possible, so here is what I did. The first thing to do is to choose your external editor, so click on “Choose” and find your PhotoLine executable file on the path where you installed it. For the rest of the settings, I configured PhotoLine, in blue square, with the same settings as the default ones for Adobe Photoshop, in the Red square. 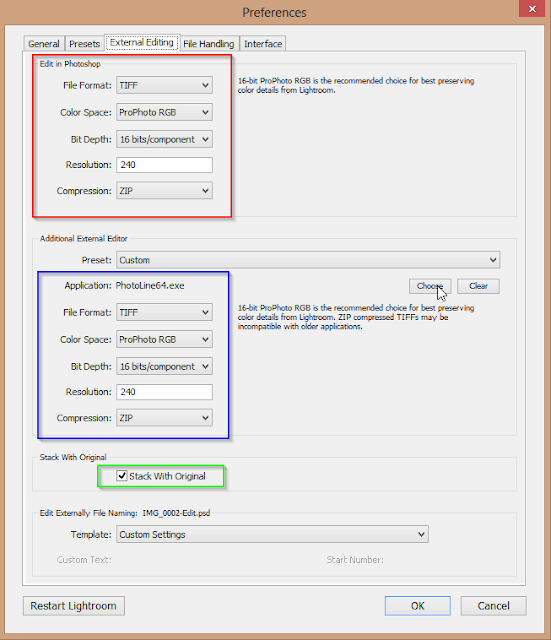 This should start to give you an idea about power of PhotoLine, it can support 16 bits/channel TIFF pictures (48 bits in all) and ProPhoto RGB color space with ZIP compression. 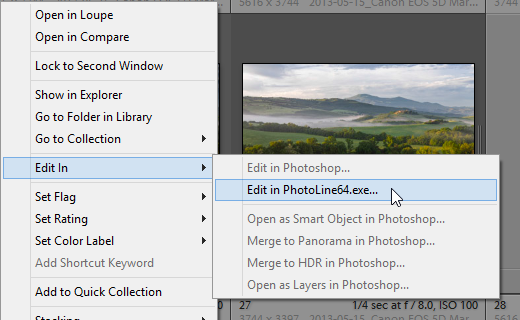 If you now go to any picture in Adobe Lightroom and right click on it, go to the “Edit in” context menu and you will see “Edit in PhotoLine64“. 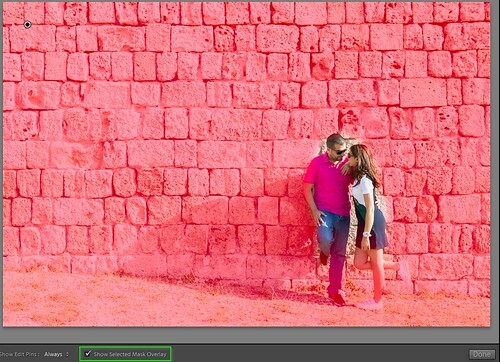 It is that easy and now changes you do on the TIFF file in PhotoLine will be directly reflected in LightRoom when you click Save. PhotoLine a worthy Adobe Photoshop Alternative at a right price. There is a lot of fuss and speculations about the Adobe new cloud licensing scheme and a lot of you out there might be on the road scanning for a solid and trustworthy replacement for Photoshop. 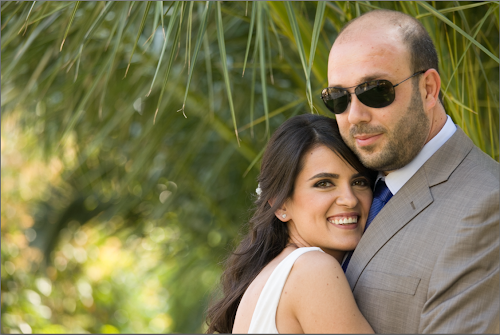 Myself have been looking for an Adobe Photoshop replacement for quite some time but couldn’t really find my joy in anything I have tried before I discovered PhotoLine. The first thing that caught my eye with PhotoLine was that it was the only photo-editing tool I found, aside from Adobe Photoshop, that could handle 16 bits per channel (or 48 bits) images. When I decided to download their 30 days trial version I was totally shocked to notice that we are talking about a mere 18 Megabytes download file. So how can a 18 Megabytes (around 80 megabyte footprint on your disk) compare to the Adobe Photoshop giant ?